The Swedish government is preparing to launch a new tax on chemicals. The tax is marketed as an environmental action but does in fact lock in harmful and hazardous chemicals into our electrical products. 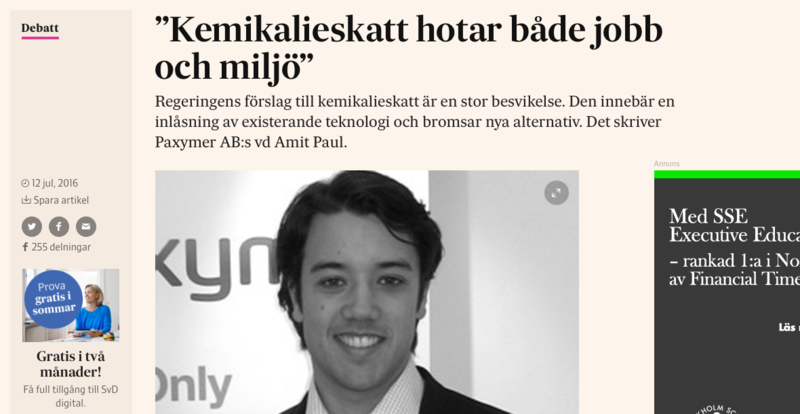 Paxymer MD partook in the debate in one of Swedens leading newspapers SvD. Read the full article here [Sv]. – A relevant distinction of hazardous chemicals. As defined in the legislation now the tax is attributed to a function rather than actual risk of the chemicals used. For instance Antimony trioxide – a proven carcinogen – will be taxed the minimum amount whereas APP – an unclassified FR – will be taxed the maximum amount. – No reward for companies that do good. The legislation does not reward companies that chose sustainable alternatives instead all companies are penalised for meeting product safety legislation. Using fiscal means to achieve substitution is something that Paxymer believes in and has been involved with previously. The legislation could have been the first step in that direction. Unfortunately the Swedish government will not achieve sustainable substitution of hazardous chemicals with this legislation. The tax will be decided in the falls budget and Paxymer strongly urges the government to reconsider how the formulation of the bill. This is an opportunity for Sweden to create more green jobs in an expanding industry and take the lead in an important environmental issue. Do not waste the opportunity.